After a long association with the South Devon Railway, Mike and Gill Comben are having a well earned rest/retirement in Switzerland. As a result of their departure announcement the South Devon Railway Association has decided to recognise their contribution to the Railway, for the hours spent collating all the volunteers’ time sheets, the sterling work carried out on the Railway’s IT systems, in the booking office and on Santa Specials, by awarding Mike and Gill honorary life membership. The award was presented by May Webster on Friday 10th May’s evening dinning train, where they were guests of the Association. 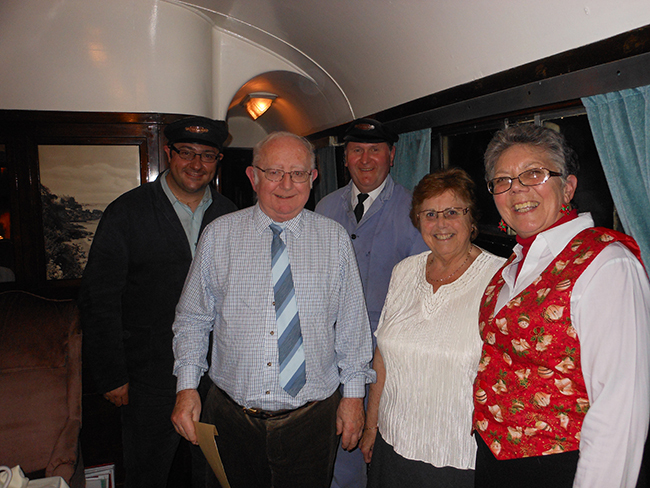 In the above picture along with Mike and Gill is May Webster, Howard Webster and Jon Taylor who were the Loco crew for the evening.